Note: EquityZen analysis above is illustrative only and displays implied internal rates of return (IRR) to previous Lyft investors assuming an IPO on 3/29/19 at $72 per share. Illustrative returns derived from analysis of company regulatory and securities filings. In an otherwise sleepy year for tech IPOs, Lyft has reignited investor focus on the public markets with plans to start trading on the Nasdaq this Friday, March 29 under the ticker “LYFT.” Lyft’s amended S-1 filing indicates that the company is targeting a price per share of $70 to $72 (and a fully-diluted valuation of up to $25 billion), which would be substantially above its last private valuation of over $15 billion at $47.35 per share (check out EquityZen’s “Lyft: Path to $15B” for a detailed look at Lyft’s valuation history). A $25 billion valuation is a big number, but what does it mean for Lyft’s prior investors? Below, we dig into just how large some of the investor paydays could be. Since venture capital and private equity firms typically measure their performance in terms of internal rates of return (IRR) or multiples on invested capital (MOIC), we analyzed each of Lyft’s private funding rounds to see how its prior investors would perform along these metrics upon Lyft’s IPO. Our returns analysis assumes that Lyft’s investors will not be subject to customary post-IPO lock-up periods and will exit their investments at $72 per share on Friday, March 29. Unsurprisingly, the data confirms the benefits of getting in early on a future unicorn—Series Seed investors, which included notable VCs like Keith Rabois, would realize a 93% IRR and a staggering 320x MOIC. Series B investors, which include Peter Thiel’s Founders Fund, would realize a 74% IRR and 34x MOIC, while Andreessen Horowitz, which participated in Lyft’s Series C round, could expect a 62% IRR and 17x MOIC. To put these returns into perspective, a 3x MOIC is the traditional threshold for a “good” investment in the VC industry. But what about the later stage investors? As we move beyond Lyft’s Series C round, the returns drop off substantially. However, the risk profile of late-stage investors, which increasingly includes private equity firms and corporations, is considerably different from their angel, seed and other early-stage colleagues. “Good private equity returns” typically translates into an IRR of 20% to 40%, as these investors tend to deploy capital in more stable, proven enterprises. 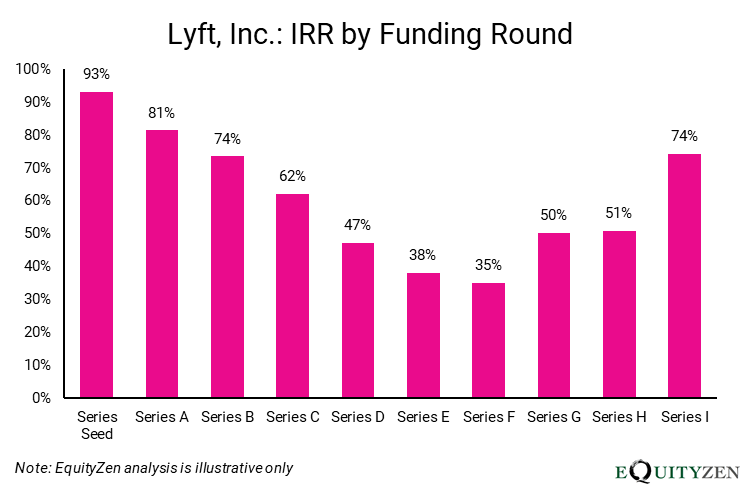 Lyft’s implied returns for its late stage investors range from 35% to 74%, which would hopefully meet the returns thresholds of Series E investors like Fortress Investment Group and Rakuten or Series G investors like KKR. Other late-stage Lyft investors include Coatue Management (Series D), Icahn Enterprises (Series E), General Motors (Series F), and CapitalG (Series H), all of which seem to be tracking to strong returns on their investments. At $25 billion, does Lyft’s valuation make sense? Yes—at least according to some of the Lyft roadshow attendees who have indicated that they will pay this price. The market will decide if Lyft’s IPO was priced correctly in the days and months after the company’s public debut. However, here are some of our initial thoughts before Lyft starts trading. Lyft’s closest comparable company is of course Uber—despite Uber’s global reach and burgeoning businesses like Uber Eats, Lyft is its only major competitor in the U.S. ride-hail market. Uber reportedly finished 2018 with just over $11 billion in revenue and is supposedly targeting an IPO valuation as high as $120 billion, implying that Uber is valued at nearly 11x its revenue. According to Lyft’s financial disclosures, the company hit $2.2 billion of revenue in 2018, which would imply a revenue multiple of ~11.4x at a fully-diluted valuation of $25 billion, quite similar to Uber. Lyft is also growing much faster than Uber (~43% 2018 revenue growth vs. Lyft’s ~104%), which would theoretically support a higher revenue multiple. A similar revenue multiple to Uber may imply that investors are offsetting Lyft’s faster growth with Uber’s global presence and the perceived potential of Uber Eats, Uber Freight and other Uber business segments. In any event, years of speculation concerning the public markets’ view of Lyft will finally come to an end this Friday. As we move closer to Lyft’s IPO, be sure to check out EquityZen’s Knowledge Center for the latest IPO news and analysis.